Amazon Customer Review : This book not only gives a description of the different types of teas, it tells how they are processed from the same plant to make the different teas and the history of tea from China to India, to Japan, to Europe, to America. There is a whole section on terminology used for herbal teas, how to grow, cultivate, harvest, dry and store them. Summary : This is an interesting tea. It has virtually no fragrance whatsoever, yet packs quite the surprisingly strong flavor of grapefruit to it, although don't be too surprised to have a "lip puckering" moment on your first sip, as the tea is a bit sour too. Review : So, the first winter storm of the year is finally rolling into the winter wonderland of the USA...Reno, NV. Actually, it's not supposed to be much of a storm here...more rain than anything else. Still, 2-3 feet in the mountains is called for, and all the snow reminds me all too well that summer is a good long ways away. And with that reminder, I sort of became in the mood for a tea that said "summer" to one degree or another. And wouldn't you know it, sitting right on my kitchen counter, was a tea that said Perky Pink Grapefruit, a herbal tea from Typhoo. Grapefruit, huh? Well, that's a summer fruit if there ever was one, so I couldn't resist giving this tea a try tonight. This tea contains the following ingredients : Apple Pulp, Hibiscus, Blackberry Leaves, Malic Acid, Natural grapefruit flavouring (6%), Bitter Orange Peel, Grapefruit Juice (2%), Lemon Grass, Rosehips, Blackcurrants, Liquorice Root, Maltodextrin, Blackcurrant Juice, Flavourings. Talk about a long list of ingredients in a tea, huh? I was getting tired just typing it all out. Like other Typhoo herbal teas I've tried, the fragrance of this tea right out of the bag was nothing you'll remember. Typical of most bagged teas, the leaves were tiny and all cut up, limiting the fragrance one gets. And since I sort of assumed that a grapefruit herbal tea, especially one with a mile-long list of ingredients, would have a powerful aroma to it, my mood deepened this winter evening. And admittedly, it wasn't helped any after I added water. Oh sure, you could get a faint whiff of grapefruit once you added boiling water. But still, the fragrance was pretty weak...darkening my already dark mood even more. But I got a surprise, thankfully. Once brewed, this tea really does taste like what I thought a grapefruit herbal tea would. While I wouldn't call this a "grapefruit replacement" by any stretch, this tea most definitely had a moderate flavor of grapefruit. So, while the tea lacked any sort of a memorable fragrance or aroma to it, the flavor at least was certainly passable for a grapefruit tea. One thing to be warned of, though...I found this tea was a bit on the sour side as well. Now admittedly, grapefruit isn't my world's favorite citrus crop, but still...I've never noticed a ripe grapefruit to "be sour." And sadly, I sort of thought this tea had too much "pucker factor" to it, the sour flavor of the tea was rather strong and quite memorable. Overall, if you like grapefruit in all shapes and forms, I think this tea might be worth a try. Just be prepared for a bit of "sour flavor" to the tea and to have a "lip puckering" moment as you take your first sip. 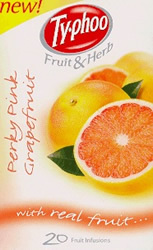 Recommendation : Yes, if you like grapefruit. If you don't like grapefruit or "sour things," this tea is most definitely not for you. Otherwise, if you and grapefruit are meant to get along, this tea is certainly worth a try. Brewing Instructions : Pour 6-7 ounces of boiling water over tea bag. Let steep for 5-7 minutes. Celestial Seasonings Tangerine Orange Zinger Herbal Tea : An orange tea that really tastes more like blackberries than anything else. Herbal Spearmint Tea : A superb spearmint tea - a spearmint lovers delight! Adagio Teas Blood Orange Herbal Tea : A rather sweet whole fruit tea that has a pretty strong citrus flavor to it, despite having a light maroon color once the tea is brewed. Adagio Teas Pina Colada Tea : A beautiful whole fruit tea that nicely blends pineapple and coconut.